Ok, I'll confess, I'm probably on a short list of people who have wanted a Morgan since they were 12(ish). As the Dodge commercial says, no kid grew up with a poster of a Passat; and that's probably true... I'll take it a step further and say no kid had a poster of a Morgan either. You just might not know it yet. Let me start with an anecdote; I was at Barrett Jackson this year, and was privileged to meet (what I can only assume) the CEO of Ferrari. You know him, right? The guy who wears the Ferrari crested polo shirt and the knock-off sunglasses and white pants at every gathering of valuable vehicles. He was standing in front of a group of Ford GT's spouting off about how it you want a "real" car you buy a Ferrari, because these Ford GT's are just garbage; cheap plastic, blah blah blah. He refers to these fine, pony emblazoned machines as "hand crafted." Well, since the most powerful man at Ferrari believes it's important, it must be! It is cool to say that your car is crafted with great care by an elite group of craftsmen. A hasty internet search turned up that Morgan Motors employs 163 workers, which I can only assume includes office staff. The crew assembles around 2 cars a day (if you're functioning on a 7-day week) so we're talking between 600 and 700 cars annually. Exclusive enough? Hand-crafted enough? Lest we forget, even if you could pronounce the names of all of those Ferrari assembly plant employees, you couldn't memorize them in an afternoon like the crew at Morgan. Let me despell a little myth too... Morgan frames aren't always wood, so, if you park it on a termite mound, you won't lose your front cross-member. Although it's still not advisable to park on a termite mound. Morgan uses various metals in the construction, including magnesium (and you thought an aluminum F-150 was cool). Now, ash is still used in the construction process, just not as much as it may have been in the past and only in limited capacities. Morgan does not make their own engines (hide the shock), but they do perform some pretty cool stunts with engines you might already know. They run a lot of frankendrives... get it? Shoe-horned into these swooping fender wearing euro-mobiles are drivetrain components from Mazda, Ford, BMW, Land/Range Rover, and S&S cycle engines out of the heart of the United Kingdom; Lacrosse Wisconsin. It all depends on which Morgan you order, as to what plant you get... To be fair, it would be much cooler if they ran on propane like their ancestors. Do you honestly think you won't look cooler than everyone else, driving a Morgan around town? Sure, it's pretty much irreplaceable if you wreck it, but let's not dwell on that. The idea is that you are driving something alien, with a top speed of 170 mph. The Morgan is a bit like a resto-mod without the "resto." The current Morgan 4/4 isn't extremely different in appearance to what it looked like 40 years ago, because it looked awesome then. Now, it just comes with a Ford inline 4 cylinder and a Mazda 5-speed transmission. And I KNOW how much you all love you some 5-speeds. but the best part? SO CAN YOU! You can own a rare, handcrafted piece of art. How? you pay less money than you'd expect. Today, in the Chicago suburbs, you can buy a used Morgan (with 4 wheels) outfitted with a 4-cylinder engine for $26,000. Seriously. You could sell one of your 2 Suburbans buy a Morgan, then buy an enclosed trailer (because it's cold in Chicago) and bring it home to enjoy for years. And if that's not good enough for you, you can buy yourself a brand-spankin'- new 3-wheeler for 50k. 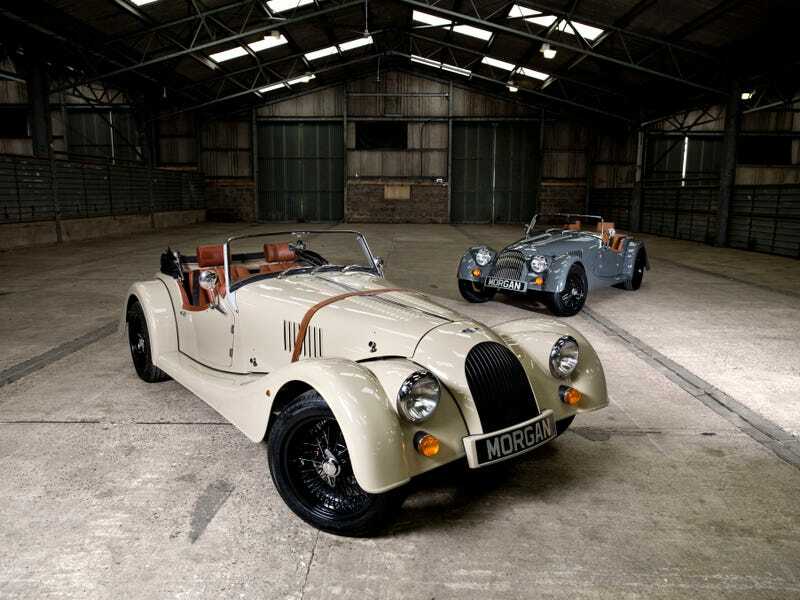 Our friends across the pond might get better deals, but for $50,000 and up you can buy a Morgan, in the color you want, the style you want; shoot, you can even get a 4-seater. No, you say, I want a track car... Ok, the same dealer in Chicago has a race-prepped Morgan (that I have personally seen) for $300,000. To be clear, there are some Morgans you can't have in the States (which is a HUGE bummer)... something about safety or whatever; but what makes Morgans so cool, is that the US government says "No, you can't sell that car here" and what do those geniuses in that glorious little workshop do? they say "ok" and don't defile a design trying to "make it work" like the rubber-bumpered Lamborghini's.